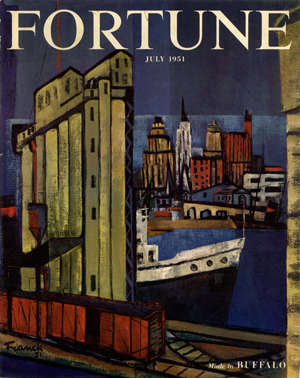 The more accurate apex would be July 1951, when Fortune magazine featured “Made in Buffalo” on its cover and devoted twelve inside pages to pictures and captions cementing the Queen City – then fifteenth largest in the country – as the hub of industry and progress. Buffalo then represented the third largest steel manufacturing center and the second largest rail hub (unfortunately, the city had lost its prominent foothold in the growing aircraft industry shortly after World War II). Earlier (January) that same year, work began on a massive superstructure highway – the Skyway (completed in 1955). We all know what happened after that. I’ll trust I don’t have to repeat the implications of the St. Lawrence Seaway, national environment protection measures and global competition. I’ll just leave it with this summary judgment: In terms of community management, Western New York leaders (political and corporate, if not more) milked the proverbial cash cows without ever planning for their eventual harvesting. As a result, the old crowded out the new until the old was bankrupt and the new took the last train for the coast. Since its peak in the 1950s, the population of Western New York has evaporated. It continues to seep south. And all the elected officials and all their appointees can’t put Western New York together again. Which, as stated, suggests a new metric for all elected officials – population, not jobs. We hear a lot of talk about jobs and the politicians are all too eager to stand by as a company opens or hires a new batch of workers. At the same time, we don’t see them as many more companies shutter or move to warmer climes (and that’s just a metaphor, not a meteorological reality). I can only conclude the “jobs” metric is too soft to be meaningful. It’s like a quarterback proudly prancing about his passing stats when the team is winless (not that we’d know anything about that). No. Jobs only represent the echoes on the wall of some Platonic cave. The reality remains the population figures. If an elected official fails to raise his jurisdiction’s population within his term, he should not be re-elected. It’s as simple as that. The only thing that counts is the headcount. A word of warning: The above represents cities, not the more often quoted metropolitan areas. Just from the above data, we can see there’s a tendency for the down state and Capital (Albany is just down a smidge and the growth of Schenectady more than makes up for it) cities to be growing and the Western New York cities to be shrinking. The metropolitan regions roughly match this (the major exception: while the city of Rochester is losing population, its greater metropolitan area is gaining population. Think about the implications of these two trends. Wouldn’t this disparity naturally cause different political priorities? You would think so, although sometimes it’s tough to tell when our elected officials seem to be more interested in promoting their respective parties rather than their common region. This difference also surfaced in the gubernatorial contest, when we found candidates seriously debating the merits of issues peculiar to New York City and its surrounding region. Indeed, there were third party candidates devoted solely to those issues. Did we see anything about the unique issues of Western New York? No. Unless you count the pabulum belched at those inane editorial board meetings. If the population doesn’t increase, we fire the elected official. Chris, I really like the population as a metric to political success. To me, population is a leading indicator because ultimately it is people who create value and wealth. We’ve been taught that we need to reduce the size of the world population. The result is that many societies now have a negative growth rate (based on live births) and the economic impact is they are losing wealth because there are not enough people to create value. In the cities we love, ROC and BUF, the issue is migration coupled with lower birth rates. We need to keep our people, attract new people and create an environment that fosters a healthy birth rate. That’s when we will see the innovation explode and the creation of wealth – again.